We are very proud of our FFA program here at Ore City High School. Our chapter is currently training for our upcoming Career Development Events (CDE's). We will have the following CDE Teams: Milk Quality, Forestry, Land, Floriculture, Nursery Landscape, Forage Evaluation, Dairy Cattle, and Farm Business Management. We have been very fortunate to compete not only at the District Level, but also have advanced to the Area and State Levels in several events. We look forward to our upcoming contests at Tarleton, Stephen F. Austin, and our Area VI Contest. One of the most important areas of FFA that we are concerned with is the development of leadership and character in the lives of our students. 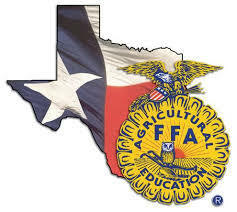 We are proud of the high standards that are expected from all FFA members and are especially proud of our students and their ability to acquire these high standards.